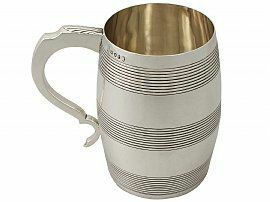 This exceptional antique George III sterling silver quart* mug has been realistically modelled in the form of a barrel. The body of this impressive large barrel beer mug is embellished with three broad bands of tooled decoration replicating the details of the bilge and quarter hoops. 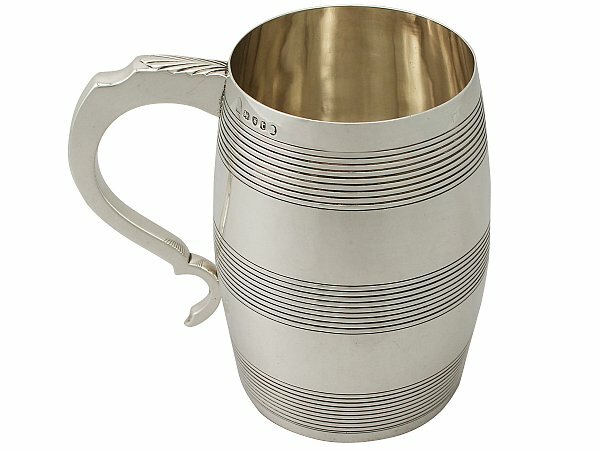 The mug is fitted with a large plain faceted opposing scroll handle accented with a leaf design to the upper plateau. The underside of the mug bears the engraved name/inscription 'W. Walker'. This large antique mug has a fine colour and patination**. ** Patination or Patina is a subtle colouration or tarnish which forms on the surface of some metals, produced by oxidation or other chemical processes. A good patina proffers an aesthetically pleasing look. This antique barrel beer mug is an exceptional gauge of silver, exceptional quality and in exceptional presentation condition. Full hallmarks struck to the surface of the mug are all very clear; the hallmarks are struck deeply due to the exceptional gauge of silver.